I have a finished sweater! All the pieces sewn up together, and all the ends woven in – ta-da! My Reverse Me cardigan is officially entirely off the needles, and…well, ready to be packed away safely to be worn next winter. But still! 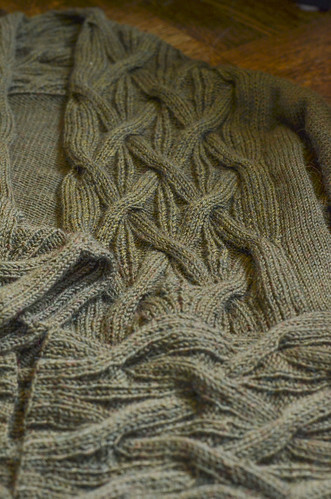 It’s done, and now the part of my brain that’s been thinking about knitting this sweater for the last 2.5 years (after trying on the original sample in a Norah Gaughan class) can let go and be freed up to think about something else. 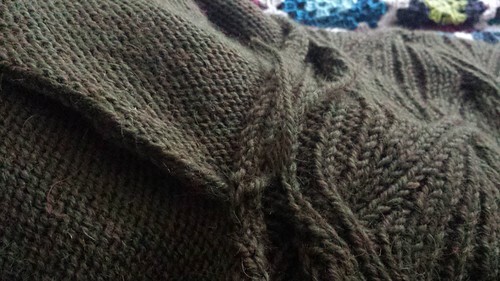 The reality is it is a drapey enough cardigan that it sort of looks like a shapeless olive-coloured blob – which is sort of the look that this style is going for, it’s true, but it’s even more drapey and blobby looking when it’s not on a person. I look forward to modernizing my knitwear wardrobe with a suitable amount of drapey-ness. These cables are quite unique, which is one of the things that drew me towards this pattern – I am a huge cable knitting fan (thank you, Captain Obvious), in my own knitting and design, so when I knit patterns that haven’t come from my own brain I often lean towards ones with cables that my own brain hasn’t thought about. These ones are great, and, true to the pattern name, reversible. That means I can flip over the collar if I want to and it’ll still look normal. The finishing up involved a new-to-me technique, which is to do a crochet seam. (There are tutorials for variations of this technique here, here, and here, among others). I’ve read about it and seen it done before but never actually practiced it myself, so no sense avoiding it when the pattern has it in my path. It’s quite a neat and sturdy finish, which is exactly what you want for a sweater that could start to feel a little too floppy quite easily, if the seams weren’t up to par. I also liked that it took some of the stress out of joining stockinette and cabled fabrics together. I will keep the technique in my arsenal for the future. As I was doing the last bits of finishing, sewing in all of the loose ends (there were a lot of them, after joining together 7 separate pieces into one sweater), I remembered something I’d heard as a very new knitter more than a decade ago. It was a designer/editor talking about how a sweater knitted by Designer So-And-So had been so immaculately finished that the photographer ended up putting it on the model inside out, because it wasn’t obvious which was the Right Side and which was the Wrong Side. 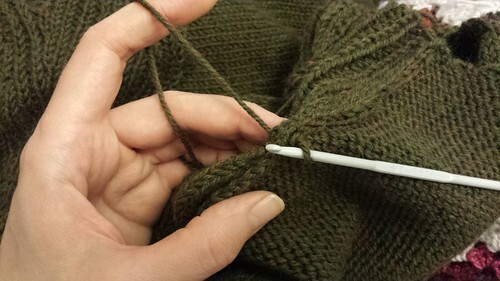 As a new knitter I was very open to stories like this, because when you’re new you spend a significant amount of your time learning new skills with each new project, before you start to find your groove and level out with a bit of confidence and memory. And that story stuck in my brain a little bit, with this idea that my seams really should be perfect, and I’ll get better at them and eventually they’ll be just as immaculate and isn’t that what we are striving for. Well, cut to a decade later and I can tell you, no, that is absolutely flaming well not what any of us should be striving for. We should be striving to learn more, and to get better, and to create garments that please us. And if your seams are immaculate, sincere blessings upon you and your house. But it helps none of us to be constantly comparing our work to an imagined standard of perfection and giving ourselves a hard time about it. I have no idea if my seams are perfect or not, but they do result in garments that hold together and look normal when worn, and that’s good enough for me. I hope that it is also good enough for you. If you are new to sewing seams – congratulations! Welcome and know that it’s something that does get easier, that a little imperfection is okay, and that if you really truly hate them there are plenty of ways to knit without them. And on that note – happy Friday my knitter friends, I hope you have an enjoyable and imperfect weekend! I’ve always crocheted my seams together and it loks good and has held up well. I have gotten the “no you shouldn’t do that” many times. I agree with you we should knit what makes us happy and forget about perfection. Nothing is perfect. Well written Glenna. Nothing handmade is perfect nor is perfect the goal. By the way, my nerdy self wants to know if your stitch markers are sitting in an Altoid’s tin? I have several of those recycled tins tucked into notion bags. The sweater looks beautiful. “Look normal” is an interesting goal. As someone whose taste runs to the eccentric, I have alway thought that good finishing proves its not all a terrible mistake. This was a great way to put it. I hope, that when the weather gets cold…hopefully months from now…that you love it justa,as much. I love love that cable pattern. Enjoyed your article, and especially comments about finishing. I have at least three sweaters waiting to be sewn together. My fun was designing and knitting them. I know I’ll make me put them together properly, but I switched to knitting a blanket in the meantime. Thank you, “Captain Obvious” of the cable-land. You’re so funny! May we please see a photo of this transition of yours from conservative structured garment to drapey-ness on yourself or at least a tall model? I think this look will look great on you as a tall person (if this is the same pattern I’m thinking of that you talked about earlier) but, like all the patterns I like that are suitable for tall people, they generally don’t look good on me, Ms. Short Person. Well, maybe the drapey-ness has to end at a shorter length(?) or maybe it just doesn’t work, period, on a short person. Now, there’s a challenge to get your remarkable brain around. amen!!! perfection is in the eye of the beholder anyway!! hope you enjoy your ‘perfect’ weekend, too! Thanks for the seaming tip. Can’t wait to give it a try. My mother used to seam her knitting like that. I completely forgot that she used that method. Many, many years ago my grandmother taught me to knit and to crochet my seams together. I agree with you heartily. We should be knitting things that please us and we should feel satisfaction in the effort we put into our creations. 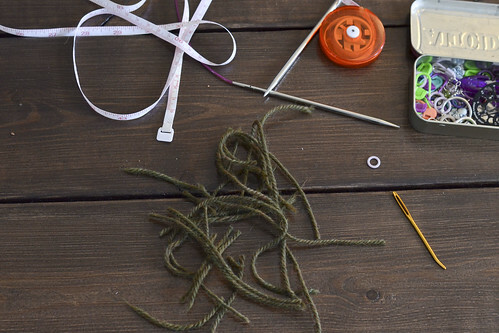 And for persons like myself who learned to knit from a grandmother, mother or other much loved family member, we should treasure that connection to the past and savor the memories our hands have stored. Interesting, thanks. 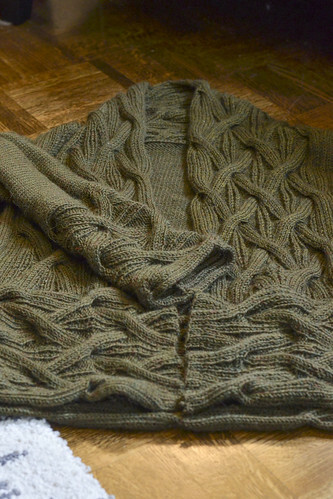 I am just getting ready to put a few seams on a sweater and I may try the crochet seam – that would be new to me, too. Beautiful work, perfect or not!